You'll be £13.00 closer to your next £10.00 credit when you purchase Shell Shocked Britain. What's this? We know that millions of soldiers were scarred by their experiences in the First World War trenches, but what happened after they returned home? Suzie Grogan reveals the First World War's disturbing legacy for soldiers and their families. How did a nation of broken men, and 'spare' women cope? In 1922 the British Parliament published a report into the situation of thousands of 'service patients', or mentally ill ex-soldiers still in hospital. What happened to these men? Were they cured? What treatments were on offer? And what was the reception from their families and society? Drawing on a huge mass of original sources, Suzie Grogan answers all those questions, combining individual case studies with a narrative on wider events. Unpublished material from the archives shows the true extent of the trauma experienced by the survivors. This is a fresh perspective on the history of the post-war period, and the plight of a traumatised nation. Suzie Grogan has drawn on a range of research sources, professional expertise and family history to investigate the psychological legacy of the Great War. This is not necessarily a book which provides answers, and it is all the better for that. By provoking questions and offering the reader an opportunity to think, it can help individuals to form their own conclusions about mental well-being in the aftermath of conflict. Suzie Grogan’s book is not just a well researched analysis of an issue often not given sufficient knowledge or understanding by historians of the period, it is as relevant today in a world still beset by conflict. There has been a great outpouring of books at the one hundredth anniversary of the Great War. They mostly refer to the great battles fought, this book however, covers a little publicised feature of the war. We are used to seeing film of limbless soldiers limping along, some in wheelchairs, thousands of maimed young men but what of the mental scarring? This book exposes what was referred to as “shell shock” which puzzled doctors, with its strange symptoms. Men went blind, mad, trembled, all due to the severe trauma of the trenches. Knowing that any minute they could be shot, blown up, or badly wounded put a strain on men so they eventually broke down. We know now that an individual can only take so much before doing so. But it also happened to women and children. The Zeppellin and Gotha bomber raids on a population worn down by war, living on poor food, caused mental distress. Many soldiers returning lived for years in asylums, many committed suicide. A valuable addition to WW1 literature and a revealing social history. The strength of Grogan’s book lies not only in the vivid pictures it paints of individual experiences of shell shock, but in the light it casts on the lasting scars inflicted by the First World War on Britain’s national psyche. The cataclysmic scale of the psychological injuries the British Army suffered in the trenches is almost beyond comprehension, but Grogan’s meticulous account gives shell shock a human face. In her moving, nuanced and deeply researched account, Grogan reveals the unexpected ways in which the legacy of shell shock has shaped contemporary attitudes towards mental health. An essential book for anybody who wants to gain a deeper insight into how our understanding of war trauma has evolved, and the ways it might be healed. A highly readable, moving and nuanced book that makes an essential contribution to our understanding of how the shell shock epidemic robbed Britain of its innocence and marked the dawn of a new era in the science of the mind. Suzie Grogan has produced a compassionate and comprehensive study of post-traumatic stress disorder that makes compelling and, at times, shocking reading. The urgent need to treat shell-shocked men and return them to the Front led to advances in the understanding of mental illness, but also gave rise to barbaric treatments bordering on torture. This short volume traces the development of mental health care for veterans through the 20th century, but it also makes a convincing case for a shell-shocked nation, reeling after WWI, unable to come to terms with what it had experienced. Grogan catalogues the horrors: trench warfare, bombing raids on civilians, bereavement (when up to 50% of those killed had no grave), post-war unemployment, homelessness, family and marital breakdown and finally an epidemic of Spanish flu which killed more people than the Black Death. This clear, accessible account will appeal to the general reader with an interest in mental health or social history. Grogan covers a range of related topics – Suffragettes, the “superfluous woman”, the popularity of spiritualism – and also includes an account of how her own family was affected by the return of a shell-shocked great-uncle who broke down completely and committed both murder and suicide. Grogan’s measured, almost elegiac tone does not disguise that this is a book written with conviction and quiet passion. Not a word is wasted. "Shell Shocked Britain" is an important book about an important subject and sadly necessary at a time when a US war veteran commits suicide every 65 minutes. Shell shock is a term familiar to everyone, coined during the First World War it has fallen into common parlance and is often used to describe a shocked reaction in all manner of circumstances. In Shell Shocked Britain, the author explains the origins and history of the term and argues persuasively that the condition which we now know as PTSD has affected men in battle for centuries. Grogan considers the effect of 'shell shock' not just on the soldiers of the First World War, but on their families and wider society in the years immediately after the war. In an accessible and engaging style, Grogan explains and dismisses some of the myths surrounding shell shock and looks at how the medical profession at first disregarded it as 'hysteria' and therefore unmanly, before gradually accepting the reality of the damage that had been done to the male psyche. Another side of the Great War that is rarely considered is the effect on the mental health of civilians who lived through the war with all its associated loss, grief, stress and fear. 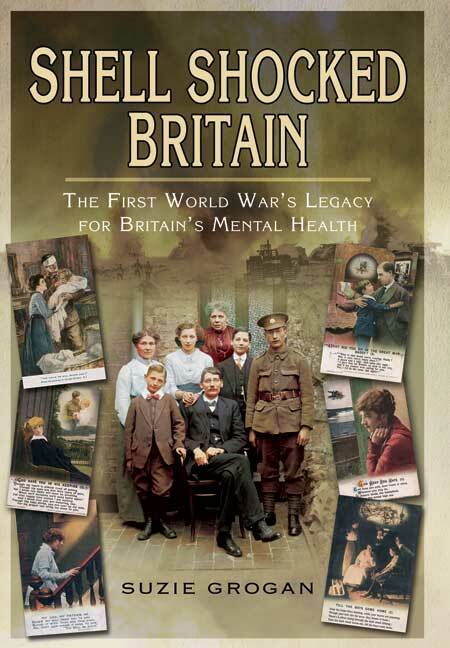 An excellent introduction to the subject of shell shock and its legacy for Britain's mental health. "...hate will be dammed up in men's hearts and will show itself in all sorts of ways." (Pacifist, David Garnett). From a personal and a family history standpoint, the subject of mental health and its effects on the men of war is a subject close to my heart. My grandmothers and aunts were the gregarious, opinionated and "strong" ones in my family whilst the men were quiet, moody and withdrawn. They were not weak, but they were suffering in a silence that most of us failed to fully realise. Suzie Grogan has taken the subject of shell shock, a term usually exclusive to the Great War years of 1914-1918, and researched its origins from as far back as the 1600s through to the Napoleonic Wars and Crimean War of the nineteenth century. This book even touches on the present day with the nation's men reeling from deployments in Iraq and Afghanistan. Grogan has left no stone unturned here; she has done her homework and taken it several steps further, never once losing focus. I am honoured to have worked with Suzie Grogan on her previous publication "Dandelions & Bad Hair Days" where she invited me to take the opportunity to give my own mental health issues a voice. For her, this book goes even further in that determined quest to remove society's tainted view of men's depression. Naturally this book also covers the women and the children of the Home Front (and other civilians) and how 'shell shock' affected them, and indeed how it affected the nation as a whole. I strongly recommend this book to anyone with an interest in the social aspects of the Great War, post-war mental health and post-traumatic stress (past and present), and especially to anyone with loved ones currently involved in military deployment. It is a book which is relevant to us all. Well done Suzie, I take my hat off to you. have to admit to knowing very little about ‘shell shock’ before reading this powerful and deeply thought-provoking book. I had no idea of the extent to which the experiences of the battlefield in WW1 not only affected those directly involved, but their family, community and subsequent generations. Shell Shocked Britain has totally changed my perception. Suzie Grogan’s well-researched and beautifully written book is a compelling account of the impact of warfare on individuals and the wide-reaching implications for society. She covers a wide range of topics, including sexual politics, spiritualism and mental health care, as well as contemporary events, such as the devastating Spanish ‘flu. At the heart of the book lies the tragic story of her own great-uncle and the tragic outcome of his war experiences. The narrative retains a strong, authoritative and personal voice throughout. It is a comprehensive and moving exploration of the legacy of WW1. Shell Shocked Britain casts a new light on the events of a century ago, and at the same time is relevant for today. I would highly recommend it. This is a well-researched work, brimming with information. The author examines not only the phenomenon of shell shock, or battle trauma, and the way it was misunderstood and treated - or mistreated - but looks at the wider implications of the illness on society as a whole. It wasn’t only soldiers who were affected; their families had to deal with the changed man who came home, and civilians were traumatised mentally and physically by air raids. The book raises the question of whether those men who had treatment for shell shock really recovered and remained well, as no follow-up was undertaken and no records were kept. It seems that some miraculous cures captured on film were faked, and there were ‘cures’ that one could buy from the chemist such as tonic wine and herbal concoctions. The situation of women – ‘superfluous’ women - the effect of the war on children, and the mental health of the post-war nation are examined. There is an interesting section on spiritualism, which became very popular when so many families experienced bereavement and organised religion seemed unable to help them. A variety of literary sources is quoted, both poetry and prose. The author shows great concern for the plight of all who have been wounded in the mind by war, from 1914 onwards. The book will appeal to those with a particular interest in the Great War, but also to those interested in social history. A century on, the shock of the war has not entirely faded away and this is a long overdue book. The author was inspired to write this book when she discovered that her shell-shocked great-uncle, Alfred Hardiman, had killed his ex-girlfriend and himself in 1922. His act sent shock waves through his community and through the generations of his own family, but it was not an isolated case. Her book examines some of the tragedies with their roots in the 1914-1918 conflict, details the trauma many experienced and examines how events reverberate down the generations to this day. A thorough study of the trauma inflicted across society by WWI. By no means a conventional Great War history, this book nevertheless represents an important part of our military and social history and as such it makes for highly recommended reading. Suzie Grogan's book is a truly fascinating and most welcome addition to our knowledge of the subject of war neurasthenia and indeed WWI; it is well-written, superbly argued and easy to understand. Thoroughly recommended and a most welcome publication casting light on yet another little known or understood aspect of the Great War. This book uses new material to chart the many tragedies which have their roots in the 1914-1918 conflict. It looks at the direct effects of shell shock on the troops and their families and examines different medical approaches to cure shell shock. The work includes many lesser known facts about the period, such as the surge in popularity of the spiritualist church. As seen in the Western Daily Press. Much has been written about WWI's horrors, but the aftermath when soldiers returned home has often been neglected. Here, Suzie Grogan looks at the legacy of the conflict on those who fought along with the impact on their families. What treatments were on offer for those with shell shock and did they work? Grogan seeks to find the answers through individual stories and an array of unpublished archive material. Fascinating study on the mental fall-out of the First World War. As seen in the Yorkshire Post. As seen in the Yorkshire Evening Post. As seen in the Wellington Weekly News. Grogan’s book brings to life the normality of what were once seen as abnormal responses to the Great War. Using a wide variety of sources, including her own family’s history, she helps us understand the ways that the shock of the Great War has still not faded away, a century after its outbreak. A masterpiece: In a dazzling display of historical writing Suzie Grogan succeeds brilliantly in bringing to life one of the monumental episodes of the British history... Such is the magic of Suzie Grogan’s blend of powerfully empathic, lively and yet erudite and superb writing that it melts away a century... her work is destined to become a classic of human history. Grogan has produced a compassionate and comprehensive study of post-traumatic stress disorder that makes compelling and, at times, shocking reading. ... This clear, accessible account will appeal to the general reader with an interest in mental health or social history. [W]hat I think I loved about the book is its cohesion. What could have been a sprawling study of seemingly disparate issues was pulled together so that everything linked up and made sense. I think that's the paradox of [Grogan's] achievement - making sense of what seems on the face of it to be so much madness. Suzie Grogan is a London-born professional writer and researcher in the fields of social and family history and mental health. Suzie's first book Dandelions and Bad Hair Days: Untangling Lives Affected by Depression and Anxiety was published in 2012 and she also writes for a wide variety of national magazines. Suzie also runs a popular blog, 'No wriggling out of writing', and presents a local radio show on literature, called ‘Talking Books’.